When I received a copy of The Feather Thief, which I had won through a Goodreads giveaway, and saw it was true crime story, I wondered why I had wanted it. 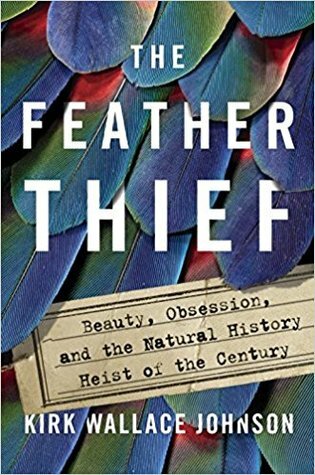 I don't typically care for true crime, upon a closer look I realized it had to do with a theft of birds from a natural history museum instead of some grisly murder spree. The scientist in me was intrigued. I love the cover, too! The crime is relatively recent, 2009, but I don't remember having heard anything about it. But then again, how big of news is the theft of some 299 bird specimens from an estate museum in England? Like Kirk Wallace Johnson, once I heard the story I was hooked and wanted to know more. Johnson does a great job of setting the scene. He goes back to the days of Alfred Russel Wallace and his expeditions to Malaysia where he collected the birds in the Tring Museum. I feel kind of bad for Wallace. He independently came to the same conclusion as Darwin about natural selection and survival of the fittest. However, Darwin published his theory first and therefore gets the credit. Wallace is a bit of an underdog. He grew up poor and becomes a naturalist through apprenticeship rather than formal education. He did not have the connections nor the money to get the best expeditions. From Johnson's telling, there may have been some professional jealousy. But Wallace is more than just a footnote in science history. His work in Malaysia earned him the title Father of Biogeography. From the history of Wallace, Johnson brings us to the present day hobby of Victorian salmon fly tying by discussing how the feather trade began with women's fashion and Wallace's lament of how knowledge of the beautiful birds he discovered would ultimately lead to their decline. With societal pressure, the feather fashion fad declined and in its place became the hobby of the wealthy - salmon fly tying. There really nothing practical about the fly it was all for show. With the scene set, the reader feels a vested interest in these bird specimens and as well as an understanding of the obsession many of these hobbyists have. Enters young Edwin Rist who becomes fascinated with fly-tying. With the same intensity he showed toward becoming a master flute player, Rist becomes one of the top talents in Victorian salmon fly tying. The first half or so of the book is setting up the background, describing the crime, and Rist's ultimate arrest and trial. The second half of the book is more of Johnson's investigation into whether justice had been served. He went in search of the missing birds (many had been confiscated from Rist's apartment or returned by those who had bought the skins and feathers, but there were still 60 or so left unaccounted for), but as questions popped up as to whether Rist worked alone or if he really had Asperger's Syndrome, Johnson became more entrenched in the mystery. As does the reader. 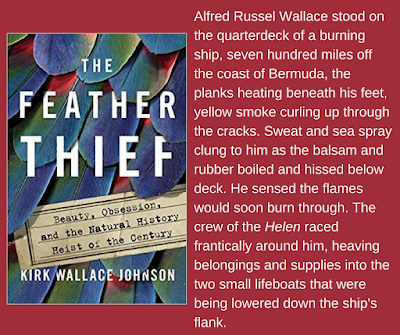 The Feather Thief is an engaging text. The cops have closed the case with a signed confession, and with murderers and terrorists on the loose, why should they keep looking? Johnson, though, draws the reader in and makes them care about this unsolved mystery. I foresee this being one of my top reads of 2018. I enjoy true crime from time to time and would be willing to try this one. Hope you like it. This does sound like a fascinating story. This week I am featuring The Body in the Ballroom by R. J. Koreto - a historical mystery from my review stack. Happy reading! I love that cover, and now I'm intrigued by the blurb and the excerpt. Thanks for sharing,and for visiting my blog. Yes, i do like that feathered cover look! I'm curious about this book. I heard the author interviewed on the radio. I love true crime but think I'd pass on this book. That cover sure catches my eye! It does sound very intriguing though I've never heard of the crime too. Wow that opening paragraph is sure dramatic. Nice start. Yes, I'm interested in reading on.